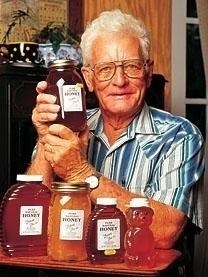 Bill Gafford is one of only seven professional beekeepers in the state of Alabama. It doesn’t take more than one bee sting for most people to form an animosity toward the flying creatures. But although Bill Gafford figures he has been stung by honeybees millions of times, he still loves the insects that are his livelihood. “ I’ve been in bees all my life – they are truly amazing,” says Gafford, 66, owner of the Bolling Bee Company in the Wald Community. The family began keeping bees in 1920 as the result of a 4-H project conducted by Bill’s father, Willie Zed. Bill’s grandfather, Zed, founded the business in 1925, and Bill took over the reins from his father in 1983. 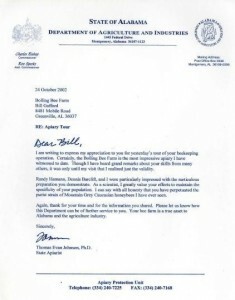 These days, Gafford says he’s one of only about seven professional beekeepers in Alabama. In addition to selling the honey in many local shops, Gafford ships packages of his Mountain Grey Caucasian worker and queen honeybees throughout the United States and abroad. He says they are the gentlest honeybees around, and he has sold up to 4,000 queen bees and more than 6,000 packages of worker bees in his busiest years. Managing his 300 hives spread throughout Butler County is a full-time, year-round job. During springtime’s peak shipping season, Gafford often spends 14-hour days working with his hives. What amazes Gafford most is that honeybees never sleep. Individual honeybees only live between 42 and 45 days in Alabama, but are in constant motion, flapping their wings to maintain a comfortable temperature in the hive and traveling up to two miles searching for nectar and pollinating. Article courtesy of Journal Communications, Inc. Click on the logo to learn more about JCI. 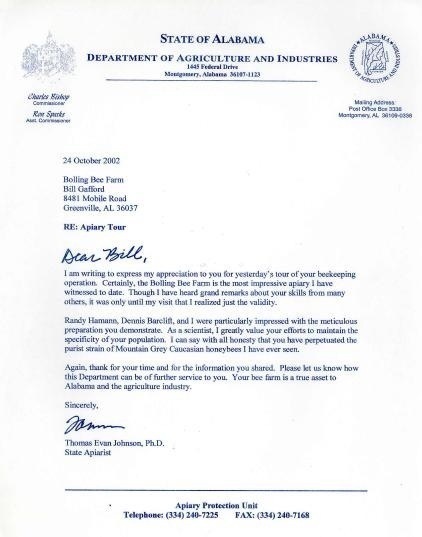 Click on image below to see larger photo of a letter Bill Gafford received from State of Alabama Department of Agriculture and Industries.